People who believe in deep time and particles-to-paleontologist evolution are not having success when studying amber. This tree resin trapped insects and other critters long ago, which trapped and encased them. It is an excellent way of preserving them, and has been friendly to biblical creation science and provided evidence for a young earth. Many people are familiar with amber in jewellery, and some are fascinated by seeing bugs in it. Of course, uncluttered amber can also be mounted on a ring or in a necklace. They are told and pass along the secularists' claim that the amber is millions of years old, but that is based on tendentious interpretations of data and spurious dating methods. Mites were found in amber, and they were dated at 230 million Darwin years. Problem is, there wasn't any appreciable change between them and their modern counterparts. This is where Darwinists circle the wagons and cry, "Stasis!" That is, things did not evolve because they didn't have to — which is a ridiculous rescuing device that actually falsifies evolution. Secularists cannot change the fact that the earth was created recently and there is no evidence for evolution, try as they mite. 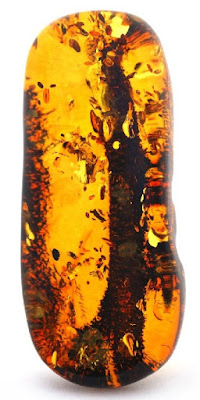 Amber (fossilized tree resin) has been known to entomb many things, including ants, ‘gladiator’ insects, crustaceans, water beetles, barnacles, oysters, clams and water striders. Evolutionists have a hard time explaining how large amber deposits formed, but a recent find is even more problematic for evolution and its long ages. To read the rest of this short article (and you may want to check out the related articles afterward), click on "Mighty mites stifle evolutionists".